South Korea's Foreign Minister Yun Byung-se (L) and his Russian counterpart Sergei Lavrov (R) give a joint press conference following their talks. Seoul may be ready to recognize Moscow as an important partner and actor in resolving the North Korean security crisis. 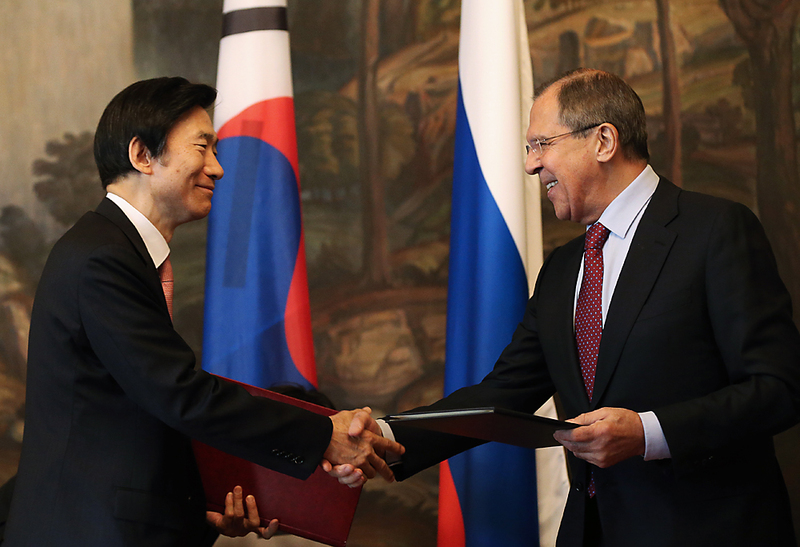 On June 13, South Korean Foreign Minister Yun Byung-Se met with his Russian counterpart Sergey Lavrov in Moscow to discuss their views on the North Korean security threat. Most importantly, the two high-level diplomats agreed not to recognize North Korea as a legitimate nuclear weapons state. They also mutually agreed on the need for continued cooperation between the two countries on North Korean denuclearization in the context of the UN Security Council. A visit by a South Korean official such as Yun to Russia is particularly important for one main reason. Many Koreans view security issues pertaining to North Korea as something that is largely their own preserve. With an undercurrent of nationalism, many Koreans hold the attitude that the "Korean knot" is something that should be solved with a minimum of interference from outsiders. While all parties realize that it is highly unrealistic to expect that the problem can be solved only between the two Koreas, the general rule of thumb has largely been to try and solve the problem with as few countries involved as possible. A visit by the South Korean foreign minister to Russia therefore sends a strong signal not only to Russia but to all of the other countries involved: It might indicate that they need the Kremlin's help and could recognize Russia's role as important. A single meeting at this high of a level between Russia and South Korea after Russia had been somewhat marginalized might provide Russia with a temporary boost in diplomatic credibility. However, the true test and verification of Russia's importance as an actor in the region will be the extent to which the Russia-South Korea node in the complex network of bilateral and multilateral coordination regarding North Korea actually provides a measure of substantive progress toward resolving the crisis. Anthony V. Rinna is a Russia and Eurasia analyst for the SinoNK scholarly research group, and a Russia and East Asia analyst for the Global Research Center in Washington DC. He currently resides in South Korea. This is an abridged version of an article first published by Russia Direct. Views expressed in this article are personal.